You're invited to celebrate with this funnier-than-ever Blu-Ray Special Edition of a timeless comedy. 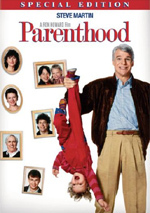 Steve Martin delivers a winning performance as George Banks, the befuddled father who has a hard time letting go of his young daughter (Kimberly Williams) when she unexpectedly announces her plans to wed. The "I do's" and don'ts of her big day prove no small feat for George as he runs into an off-the-wall wedding planner (funnyman Martin Short), his patient, level-headed wife (Diane Keaton), and hysterical hitches. You won't want to miss the never-before-seen bonus features, including behind-the-scenes interviews, commentary, and the Steve Martin & Martin Short interview - now available to have and to hold forever! Today’s chapter of Things That Depress Me: 20th Anniversary Editions for movies that feel like they came out yesterday. Things That Depress Me More: when I realize that the “20th Anniversary Edition” actually appears 21 years after the movie’s release. Such is the case for 1991’s hit comedy Father of the Bride. When Annie Banks (Kimberly Williams) gets engaged to Bryan MacKenzie (George Newbern), a virtual nightmare ensues for her father George (Steve Martin). First he’s upset that his little girl has grown up, and then matters get worse as he realizes how involved and expensive the wedding will be. George gets more and more worked up as the complexity – and costs – escalate. Back when I first saw Bride in 1991, I was 24 and should’ve much more closely identified with the Annie and Bryan characters. I didn’t – I thought she was a spoiled brat and he was a mewling simp, so I disliked them and the movie. 20-plus years later, I have a more natural age-based reason to connect with George and Nina, but George remains the only moderately likable personality. My problem then – and now – comes from the movie’s absurd sense of wedding necessity and rampant consumerism. George wants something simple and small, and everyone looks at him like he’s insane. Personally, I like George’s initial idea of a basic backyard wedding, but it’s clear the movie’s sympathies lie with everyone else and we’re supposed to think the desires of Annie and the others are utterly reasonable. This quickly gets nauseating, and the manner in which the film wants us to view George as the jerk bugs me to no end. Our first sign of this occurs when George, Annie and Nina meet with wedding planner Franck (Martin Short). Everyone but George thinks a $1200 cake – which would equal about $2000 today – is a reasonable expense. When George protests that $1200 seems awfully steep for something as simple as a cake, the others roll their eyes and act like he’s the World’s Cheapest Man. Puh-leeze. I’m completely with George, but apparently I’m alone. In this world of Bridezillas, we’re supposed to accept that every girl’s “big day” means she’s entitled to see her every idiotic, expensive whim satisfied. The cake scene isn’t the movie’s nadir, though. The low point occurs when all George’s protestations lead Annie to – eek! – read a book about how to run a wedding on a budget. It includes such horrific ideas as baking your own cake or getting a friend to take the photos. Oh my – how awful! It’s so much more important that George spends a month’s rent on a cake, isn’t it? Why do something reasonable such as make it yourself? Clearly a fancy, expensive cake will be so much better, and there’s no way a friend could take competent pictures, is there? Sorry for the sarcasm, but the film’s misguided sense of loyalty and love drives me up the wall, and those attitudes spoil it for me. Not that I think there’s some gem hidden beneath all the rampant consumerism. At its core, Bride delivers fairly banal family comedy. It seems designed to do as little to offend as possible. If you occasionally laugh along the way, that’s fine, but as long as it doesn’t provoke any strong reactions, its filmmakers seem happy. I’m not. In fact, I’m pretty annoyed that Bride wastes talent like Martin, Short and Diane Keaton. Heck, I’m not even sure why Keaton agreed to the movie; why bother to cast a major actress like her and give her such a lackluster part? As Annie’s mother, Keaton has little to do; why bring in Keaton to stand around with no apparent purpose? Martin carries most of the load, but the film works so hard to be light ‘n’ inoffensive that he seems neutered. Short got lots of praise for his work as the quirky Franck, but I don’t get it. I love Short from his SCTV days, but Franck’s an annoying snot who’s really just nothing more than a riff on Serge from Beverly Hills Cop. Heck, even the one positive I saw in 1991 doesn’t work for me now. Back then I thought Williams was absolutely gorgeous and borderline perfect – physically, that is. Now? She’s cute – I certainly don’t want to say she’s unattractive – but I can’t figure out why I felt so smitten by her 20 years ago. So that leaves Father of the Bride as a movie that does almost literally nothing for me. Nothing other than jack up my blood pressure via its misguided interpretation of love and duty, that is – I remain as offended by its warped sense of values as I did back then. This is lame comedy with a terrible message. Father of the Bride appears in an aspect ratio of approximately 1.85:1 on this Blu-Ray Disc. Movies from the early 90s don’t often age well, but this one looked surprisingly good. Overall sharpness seemed positive. Some interiors could appear a smidgen soft, but those instances didn’t cause notable issues. Instead, the majority of the movie showed nice clarity and accuracy. I found no problems with jaggies or shimmering, and edge haloes failed to materialize. Print flaws didn’t cause distractions, as the image remained clean. Colors looked fine. Like many movies of this one’s era, the hues could be a little heavy, but that wasn’t a notable concern, as the tones were usually pretty peppy and natural. Blacks were dark and dense, and shadows showed nice smoothness. I admit I didn’t expect much from the transfer, so I felt pleased with its high quality. In addition, the film’s DTS-HD MA 5.1 soundtrack worked pretty well for a comedy. Films in that genre don’t usually offer lots of chances for tons of activity, and this one followed suit, but it had a little more pizzazz than usual. The track featured good environmental information and created a nice setting. Some of the elements were a bit too localized, but they usually blended together fairly well, and the surrounds added solid involvement. Nothing here dazzled, but the track delivered a quality sense of place. Audio quality was fine. Speech seemed reasonably natural; a little edginess occurred at times, but not to a significant degree. Music was lively and full, while effects showed good accuracy and clarity. All of this resulted in a perfectly acceptable soundtrack. A few extras round out the set. We find an audio commentary from director Charles Shyer. He provides a running, screen-specific look at the source film and its adaptation, cast and performances, story/character areas and pacing, sets and locations, production design, themes and tone, and a few other topics. Recorded for the film’s 15th anniversary DVD, Shyer delivers an amiable, engaging chat. He touches on all the requisite subjects and keeps happy talk – often a problem for extras related to this kind of movie – subdued; while Shyer praises the folks involved, he doesn’t go overboard. Instead, he touches on a lot of good filmmaking subjects – especially in regard to changes from the original movie – and makes this a solid commentary. Two featurettes follow. 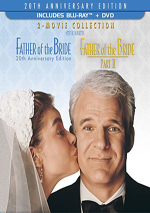 An Invitation to Father of the Bride goes for 10 minutes, 36 seconds and includes notes from Shyer, co-writer Nancy Meyers, and actors Steve Martin, Martin Short, Kimberly Williams, and George Newbern. The piece looks at story and characters, cast and performances. Short offers some decent thoughts about his role, but otherwise, this is nearly information-free fluff. We get more from the actors in Martin and Short Interview Each Other. During the five-minute, 14-second reel, they discuss Short’s role – as the bride – and other aspects of the film. It’s all a lot of joking, of course, but it’s funny, so it’s worth a look. The disc opens with an ad for The Odd Life of Timothy Green. No trailer for Bride shows up here. A Bonus DVD of Bride also comes as part of the package. This gives us the same extras as the Blu-ray, which adds value. I actively disliked Father of the Bride when I saw it 20-plus years ago, and I can’t stand the film now. Its values seem misguided at best, and even when I ignore that factor, it’s simply bland, lowest common denominator comedy at its most forgettable. The Blu-ray brings us pretty good picture and audio along with supplements led by an enjoyable audio commentary. Bride comes to us as a good home video product, but I can’t stand the movie itself. 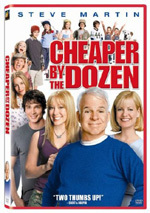 Note that the Blu-ray can be purchased only as part of this three-disc “Two-Movie Collection”. It packages the 1991 Bride with its 1995 sequel on the same Blu-ray; the other two discs provide DVD copies of the films.